A Quiet Place might center on the importance of silence but the buzz around it has been anything but quiet. The horror film debuted at SXSW to a standing ovation, and currently holds a 100% on Rotten Tomatoes ahead of its public release. The rave reviews and positive reactions are only increasing anticipation for the film. A Quiet Place could be the latest movie to make waves in horror. The suspenseful story sounds simple. A family of four, with parents played by husband and wife John Krasinski and Emily Blunt, must avoid all noise in order to survive. However, the fight for survival is even more unusual than it seems. After an invasion wipes out most of humanity, the survivors still face the threat of lurking creatures. These monsters are attracted to noise, hence the rule of silence. But while trying to raise young children, total silence is all but impossible. A Quiet Place will be unlike anything we’ve seen in theaters, for several reasons. He will always be Jim Halpert to some fans, but John Krasinski broke out of the sitcom shell long ago. After The Office ended its nine-season run, Krasinski focused on the big screen. Not only did he appear in films, he explored opportunities behind the camera. Krasinski served as an executive producer for the Academy Award-winning 2016 film Manchester By the Sea. That same year, he wrote, produced, directed, and starred in the comedy/drama, The Hollars. A Quiet Place is Krasinski’s latest project working in a multi-faceted capacity. 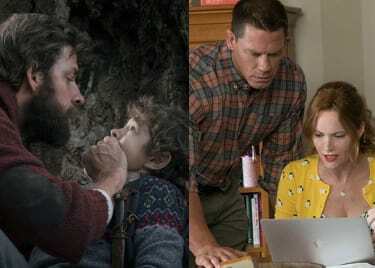 The script for A Quiet Place came across Krasinski’s desk in 2016. He was drawn to it because the story revolved around parents protecting their young children. Krasinski agreed to star, and with the help of Blunt he decided to direct as well. After the studio enlisted him to rewrite the script, Blunt was so intrigued by the story she eventually asked to star opposite her real-life husband. Even though this movie will be Krasinski’s third time in the director’s chair, it’s his first time directing for a major studio. Krasinski has been vocal about not being a huge horror fan while growing up. Having him as director one of the most anticipated horror films of the year is a surprise. But for Krasinski exploring horror while also telling a unique story was a no-brainer. It also demonstrates the accessibility at the root of horror – we all have fears and anxieties that can be parlayed into an effective tale. “If they hear you, they hunt you.” It only takes seven words to explain the predicament faced by the Abbott family. Surviving a post-apocalyptic world is one thing but staying hidden from mysterious creatures is another. To represent the need to hide, the film features minimal dialogue. So how can a movie tell a story without characters talking? Pure visual storytelling is the key to depicting how the Abbotts have adapted to their new normal. We see them walking barefoot on paths of sand to remove the sound of footsteps. They rely on sign language to speak. That communication extends the film’s meaning in other ways, too. Their daughter is deaf, and it was imperative for Krasinski to hire a deaf actress. At SXSW, Krasinski spoke quite a bit about the film. In an interview with Bloody Disgusting, Krasinski shared his thoughts on co-star Millicent Simmonds. Simmonds tutored the rest of the cast in American Sign Language. She worked with Krasinski to ensure the on-screen portrayal of ASL was authentic. The cast and crew had an invaluable resource in Simmonds. Krasinski also felt the film’s score would be crucial. Music is key to many films, but in horror the score can be just as effective as dialogue. Even if the characters are avoiding all sound, music can “voice” an unseen threat and trigger audience anxiety with just a few chords. Horror constantly evolves and goes through waves. We’re in a period where horror isn’t just a cookie-cutter format churned out by studios to provide a few scares. The groundbreaking success of a movie like Get Out has opened up new avenues in the genre. Krasinski used the film as research before fully taking on A Quiet Place. He wanted to use the film as a way to spark discussion that reaches beyond the influence of a typical monster movie. This isn’t a typical apocalyptic situation; resources and essentials are still available. Yet survivors must make difficult choices on a daily basis. As for the Abbott family, some choices will work against them. As they try to make through their day-to-day lives, their future will always be at stake. A Quiet Place hits theaters April 6, 2018.